Tofukuji Temple is one of Kyoto’s oldest and most famous temples, and very easy to get to as it is just one stop away from Kyoto Station on the JR Nara Line. 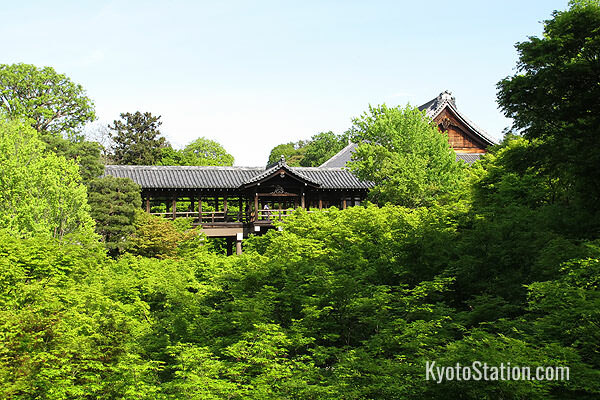 This temple is renowned not only for its historical buildings, and the artistry of its gardens, but also for a deep ravine filled with maple trees that runs through the center of its grounds. In all seasons visitors can enjoy spectacular views here from the quaint wooden bridges that cross the ravine, but in the autumn when the maples are a blaze of red the sight is unforgettable. Tofukuji’s original buildings were destroyed in a series of fires in the 14th century, but were all faithfully rebuilt according to the original plans. Another fire in 1881 destroyed the Buddha Hall which was never rebuilt, as well as the Main Hall and Abbot’s Quarters which were restored. However, several other buildings on the grounds have survived since the medieval era. 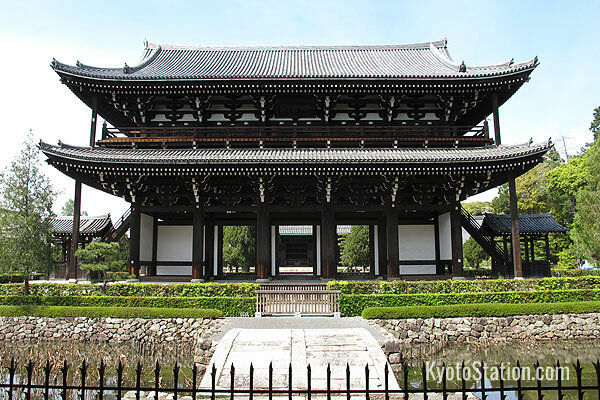 This Sanmon, or “enlightenment gate” is two stories and 22 meters high, with three entrances, and a gabled roof topped with ceramic tiles. Along with many other temple buildings, the gate was destroyed by fire several times, but the current structure dates from 1425. 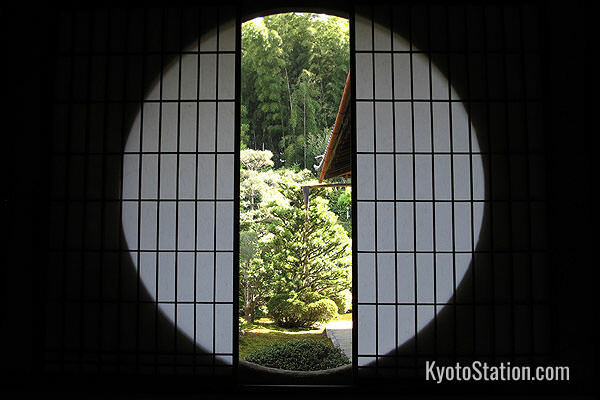 It is the largest and oldest Zen temple gate in Japan and so is a designated national treasure. The Hondo, or Main Hall, is a recent structure dating from 1934, as the original was destroyed by the fire of 1881. Usually closed to the public, you can view from the outside the central statue of the historical Buddha shining on its altar. To celebrate the anniversary of the Buddha’s passing, the Hondo is opened to the public every year from the 14th – 16th of March. At this time a huge Muromachi era picture of the death of Buddha is displayed here. If you can visit at this time, this is also a good opportunity to view the dragon painting on the ceiling which was painted by the renowned modern artist, Domoto Insho. 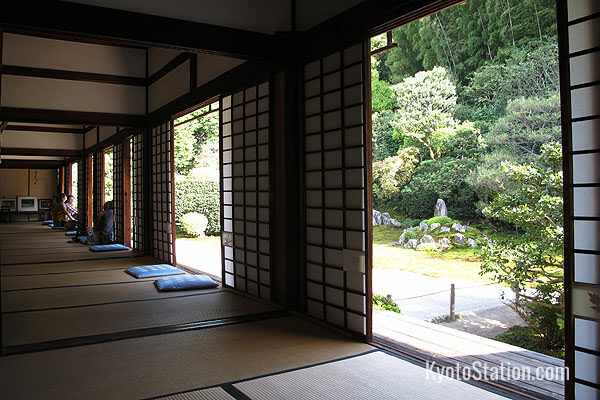 The fee for entry to the Hojo, or Abbot’s Quarters, is 400 yen. This charge is definitely worth paying for a view of the gardens that surround this building. After being destroyed by the fire of 1881, the Hojo was rebuilt in 1890. Its gardens however, were designed in 1939 by the legendary landscape architect Mirei Shigemori, who combined Zen aesthetics with a modernist sensibility. 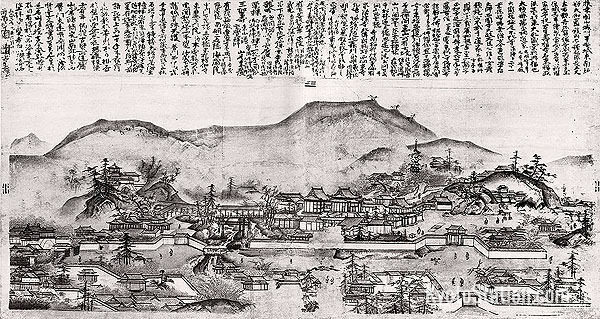 The gardens are now considered a masterpiece, but are one of Shigemori’s earlier works. At the time he was so happy to be given such a prestigious project that he offered to do the work for free. 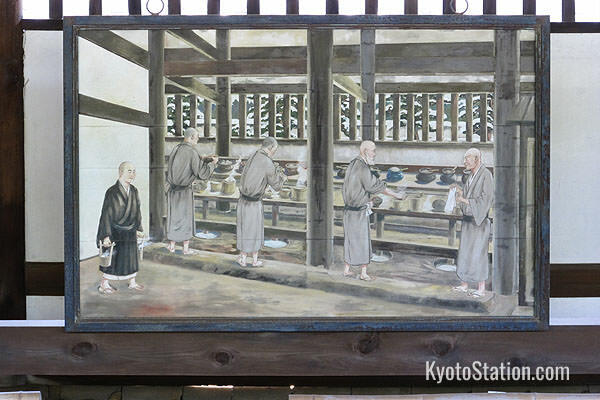 In return the abbot promised him that the monks of Tofukuji would pray for his soul “now and forever”. 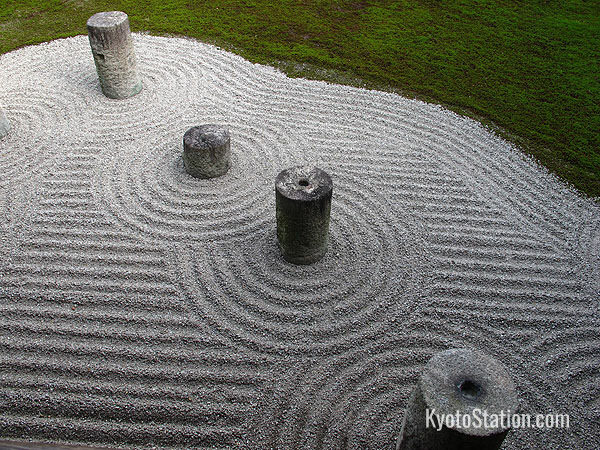 On the south side of the Hojo is a traditional Zen garden with a sea of raked sand and rocks arranged to represent sacred mountains. To the east there are cylindrical standing stones arranged to represent the constellation of the Big Dipper. 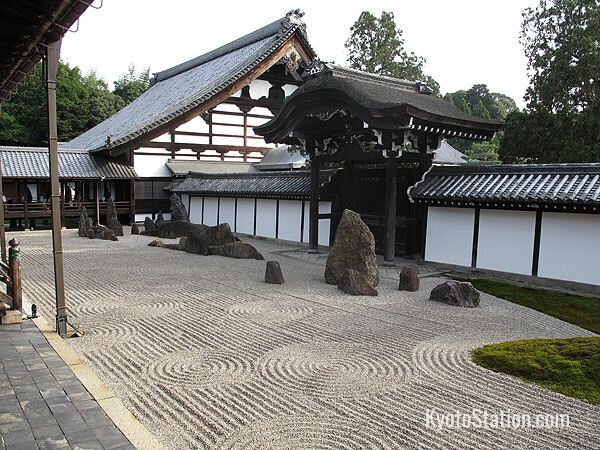 These stones were originally the foundation pillars of the temple’s latrine.The abbot of the temple had specifically asked Shigemori to reuse various materials in his design, because according to Rinzai Zen beliefs, nothing should be allowed to go to waste. 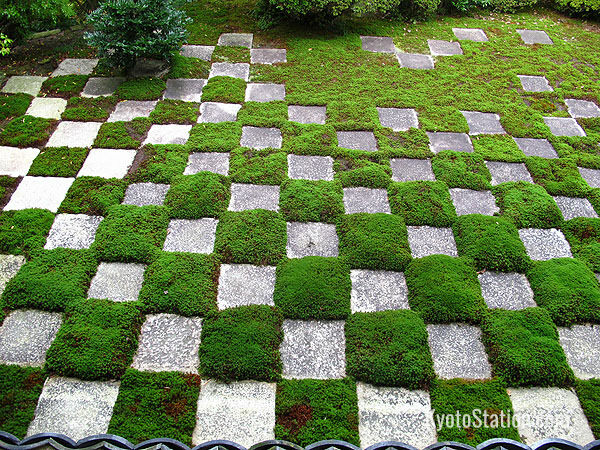 The garden to the north has a checkerboard pattern of square stones and moss. The stones used here are another recycled material having originally been paving stones for the entrance. 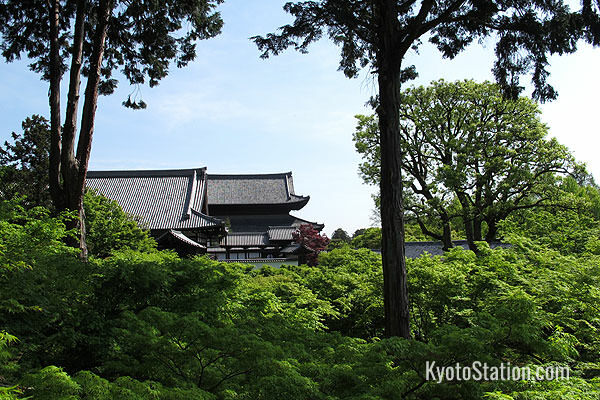 From this garden you can view the maple filled ravine that runs through the temple grounds. 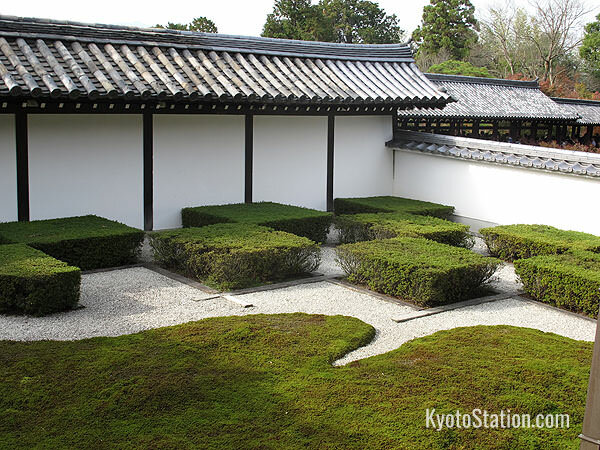 The western garden has another checkered pattern, but this time of moss, sand, and finely pruned azalea bushes which represent rice fields. Entry to the Hojo is 400 yen for adults and 300 yen for elementary and junior high school students. 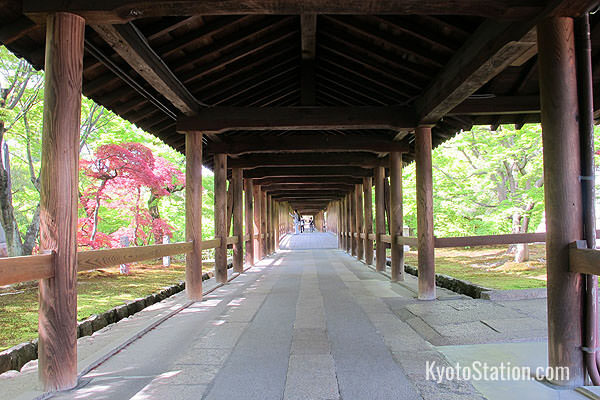 Not far from the Hojo is a roofed wooden walkway that leads to a bridge over the ravine and then on to the Kaisando or Founder’s Hall. Like the Hojo, there is a 400 yen fee to gain entry here, but again it is definitely worth it for the chance to view and explore the maple filled ravine. The name of the Tsutenkyo bridge, can be translated as “bridge crossing heaven”. The Founder’s Hall holds a statue of the temple’s first abbot, Enni Ben’en. 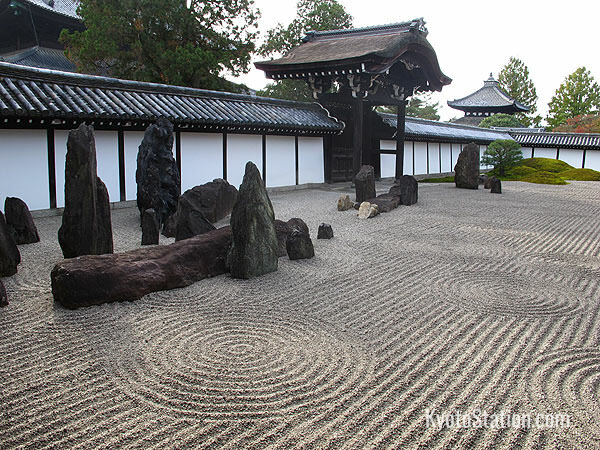 Here you can enjoy another garden with a traditional arrangement of rocks, moss and bushes on one side of the path, and a raked sand checkerboard design on the other. Entry to the Kaisando is 400 yen for adults and 300 yen for elementary and junior high school students. 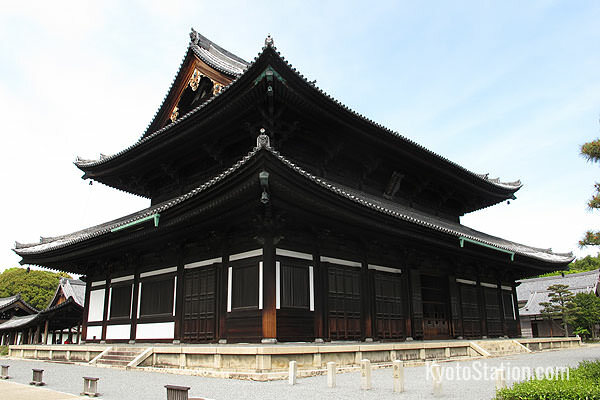 In the south west corner of the grounds you can find a long low building called the Tosu. This was formerly the temple toilet, and it is the oldest temple toilet in Japan. This building is usually closed, but you can peek in through the windows and view some pictorial displays representing monks using the building. Formerly this building was an important source of revenue for the temple, as the human waste gathered here was sold as agricultural manure. 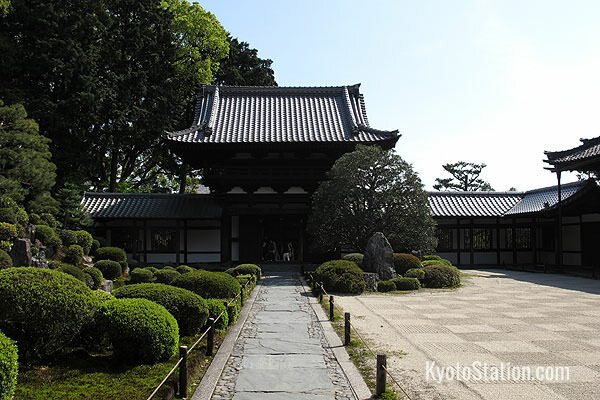 To the north of the Tosu is the Zendo which dates from 1347. 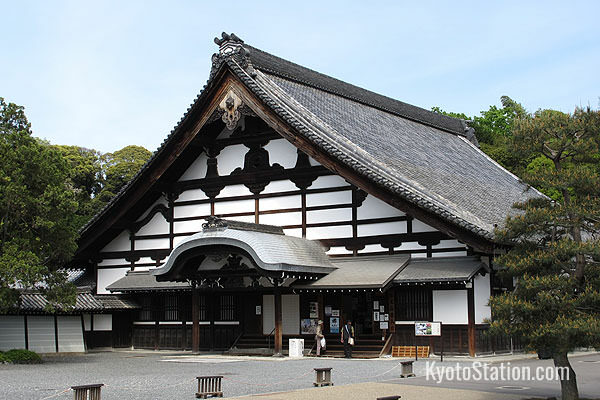 This is Japan’s oldest and largest meditation hall and is a nationally designated cultural property. There are two gates in the south west corner of the grounds which are also of historical importance. The west facing Chokushimon, is the Imperial Messenger’s Gate and as such, it is usually kept closed. This gate dates from 1594. 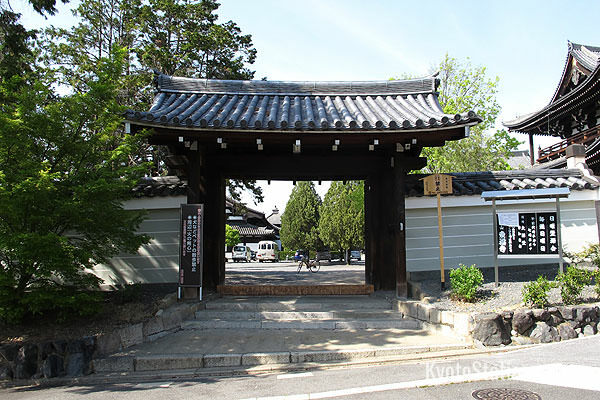 At right angles to the Chokushimon is the Rokuharamon Gate which before being moved to this location was the gate for the Rokuhara headquarters of the Kamakura government in Kyoto. The gate dates from the early part of the Kamakura period (1185–1333) and it is the oldest structure on the temple grounds. 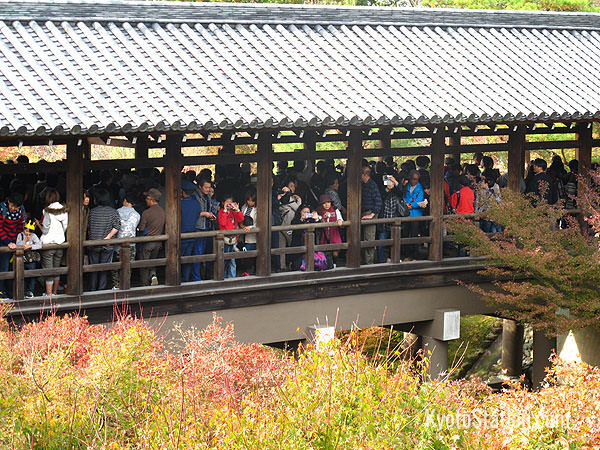 Tofukuji Temple is very popular in the autumn, particularly in mid November when the maple leaves are at their most exuberant. At this time however, the temple gets very crowded and there are very long queues to visit the Kaisando and Tsutenkyo Bridge. The maple leaves are spectacular in this season, but it is best to visit in the early morning to avoid the worst of the crowds. 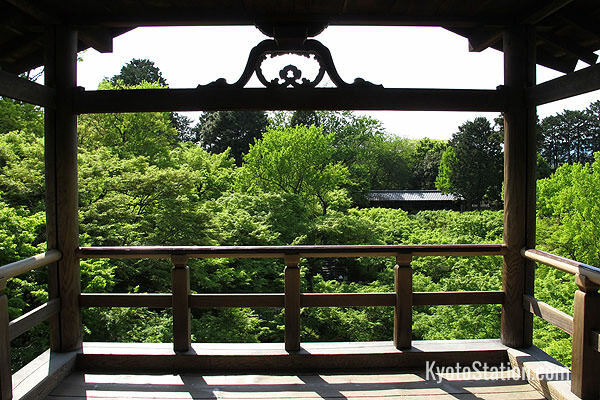 In other seasons the temple grounds are much quieter, and in spring and summer the view over the ravine resembles a sea of green. Though most of the 25 sub-temples surrounding Tofukuji are closed to the public, the quiet lanes between them are a pleasant area for strolling and there is no harm in having a quick peek in at the sub-temple gates. 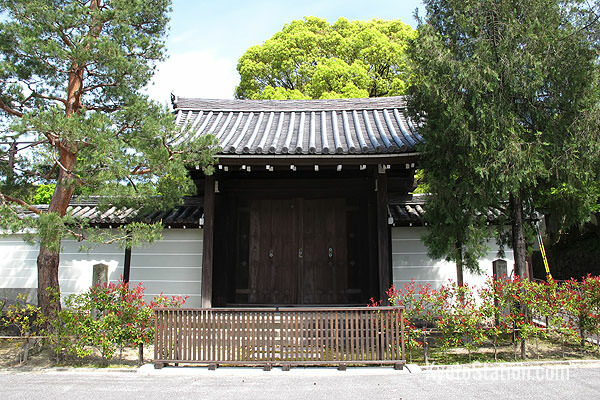 One sub-temple to the west of Tofukuji that you can visit is Funda-in. 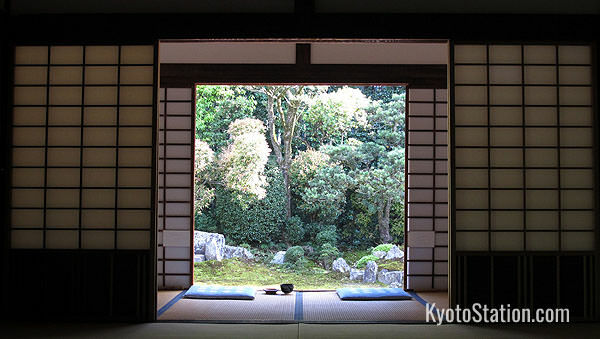 This is a quiet and peaceful spot with a garden originally designed by the famous landscape painter Sesshu Toyo (1420 1506). For this reason Funda-in is also known as Sesshuji. 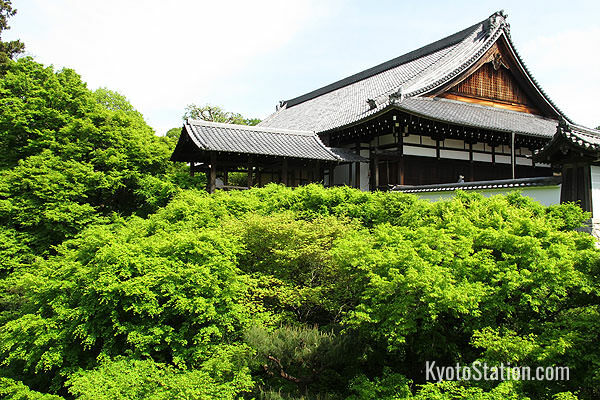 The current garden is a restoration by Mirei Shigemori and dates from 1939. After exploring the grounds of Tofukuji, why not stop in at this smaller temple and enjoy the garden with a cup of green tea? It is a great way to relax. Entry to this temple is 300 yen and a cup of green tea and a sweet will cost you 600 yen. 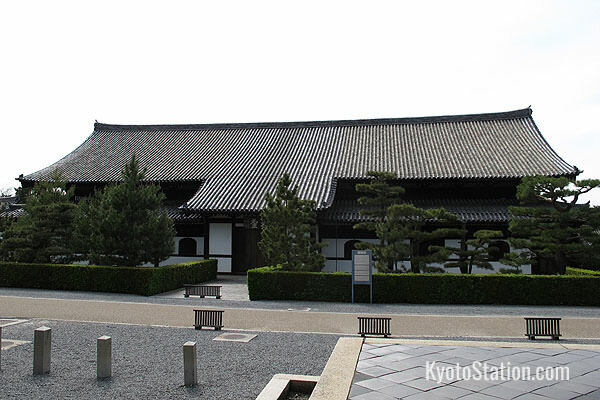 Tofukuji is located south east of Kyoto Station and is very easy to get to. There are two railway stations which are right beside each other: JR Tofukuji Station and Keihan Tofukuji Station. If you are coming from Kyoto Station you can use the JR Nara Line and get off at the JR station. If you are traveling from the center of Kyoto city you will most probably use the Keihan Main Line and get off at the Keihan station. This is also a useful point for transferring between these two lines. Once out of the station, the way to Tofukuji Temple is clearly signposted and you should have no difficulty finding your way. Walking between the two stations and the temple should take no more than 10 minutes. 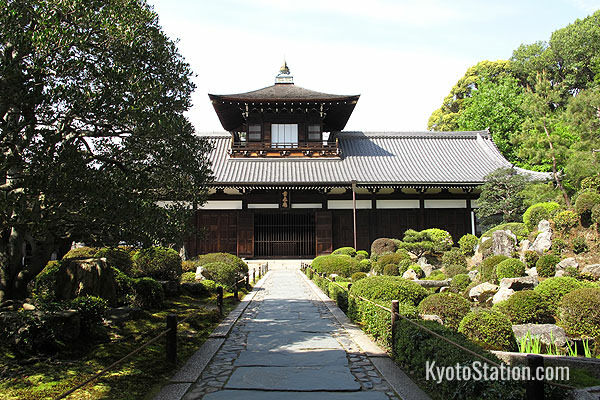 Entry to the temple grounds is free, but there is a 400 yen fee to enter the Hojo and the Kaisando.